Even when something I make isn’t quite worth sharing, it’s usually edible. My first loaf of bread was NOT. I can’t say I’ve got whole wheat down the way I would like to yet. But it’s edible these days. I still don’t know what happened the first time around, but I have put it behind me. The only thing I still muck up sometimes is when I take the bread out too early, which I don’t do assuming I can find the probe thermometer! Mostly these days, I’m making dough for several loaves at a time, and not kneading, thanks to Artisan Bread in 5 Minutes a Day. It’s so convenient–I stir together some ingredients, let it sit on the counter a couple hours, and then shove it in the fridge. 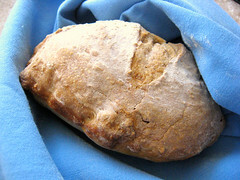 Then when I want bread, I take out however much dough I want, shape it, let it rise, and pop it into the oven. It’s perfect for having two of us– we end up having fresh bread all the time, instead of eating half of a large-ish loaf, and then trying to find something to do with the second half before it gets too stale. The original recipe, as linked, has you use a fourth of the dough at one time, I’ve upped it to a third. It’s so flexible– I can make anything from bread to calzones with it– although, to be honest, the Alton Brown overnight pizza dough recipe is much better for shaping into pizza or calzone shapes. And it’s so easy to do that even my mother, who hates anything to do with baking, will make this bread. I can now make a nice loaf of kneaded dough without worrying about it all that much. But I usually don’t. Even if you outsource the kneading to a bread machine, stand mixer, or food processor, you still have to be near it. I enjoy it sometimes, especially if I only want one loaf of something. But having a bowl full of bread dough in my fridge is so convenient. In any case, that’s what I’ve spent most of my baking time doing for almost the past year and a half! Dough, dough, and more dough. It’s been a huge learning experience. There are some great tips at Smitten Kitchen. But mostly I’m happy to keep learning at this point. Huh! I’m interested to hear this. I was pretty unimpressed with _Artisan Bread in 5 Minutes a Day_. First, if you actually follow their instructions, 5 min/day is a big underestimate—just getting out the pizza peel, bin of water, etc. takes more than 5 min. And actually adding up the time, from getting out ingredients to eating bread, only 1/2 hr is saved over traditional bread recipes. Then, I found that refrigerating the dough made it stickier and more difficult to handle, and loaves baked from the fridge had poor shape and consistency. Finally, their recipe made super-salty bread—so salty I could barely eat it! I have modified their recipe and simplified the process so that it works well for me, and takes a bit less time than my traditional bread recipe (hey, only 3/4 as many ingredients!). Let me know if you want either of my versions, though of course a KitchenAid is required for both. I agree that “five minutes a day” oversells the concept. But when I get a bread craving, if I’ve got a bowl of dough in the fridge, it’s 40 minutes away from baking, instead of something closer to twice that amount of time. I’ve found that shape depends on the wetness of the dough- if I haven’t added quite enough flour, my bread is shaped like a puddle. If I’ve added more, it turns out fine, if not quiiite as pretty as a kneaded loaf.